Catholic Controversies gives Catholics and others seeking the truth a valuable resource for correcting the most common misunderstandings and myths perpetuated by the media, university professors and the uninformed. Catholic Controversies collects the very best articles addressing most of the hot-button issues used to undermine both the authority of the Church and the faith of Catholics, especially young people. The topics range from proofs of Gods existence to the Spanish Inquisition to human cloning and stem-cell research. I can't imagine a better or handier reference for explaining and defending the Catholic position on all the hot-button issues. Stephen Gabriel has surveyed many different fieldsbioethics, public policy, history, sociologyto find the most authoritative and compelling voices. This book is as close to the Last Word as you're going to find between two covers." Read Christopher Chapmans review of Catholic Controversies in the Pittsburgh Catholic by clicking here. 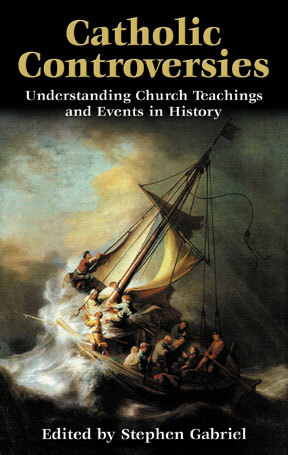 Read Tracy Mehans review of Catholic Controversies in The American Spectator by clicking here. Click here to read the Table of Contents and to see the list of well-known contributing authors and hot topics. Click here to read the book's Introduction. Hear Stephen Gabriel discuss Catholic Controversies with Al Kresta on the Kresta in the Afternoon" show on February 8, 2011 by clicking here. The interview begins about a third of the way through the program. Hear Stephen Gabriel discuss Catholic Controversies on Relevant Radios Morning Air show with Sean Herriott on June 10, 2011 by clicking here. The interview begins about minute 30 during the program.